National Aboriginal Day was actually celebrated on June 21st, but in honour of the occasion, I’m operating on Dene time. The day is recognized across Canada, but it’s a public holiday in the Northwest Territories. I’ve read that half the population of the territory is comprised of Aboriginal people and I’ve seen that aside from English and French, there are 9 other languages recognized here, all indigenous. So I think that celebrating the day with a holiday is very much in order. Give me a holiday any time and I’ll be happy to celebrate anybody else’s special day as well. 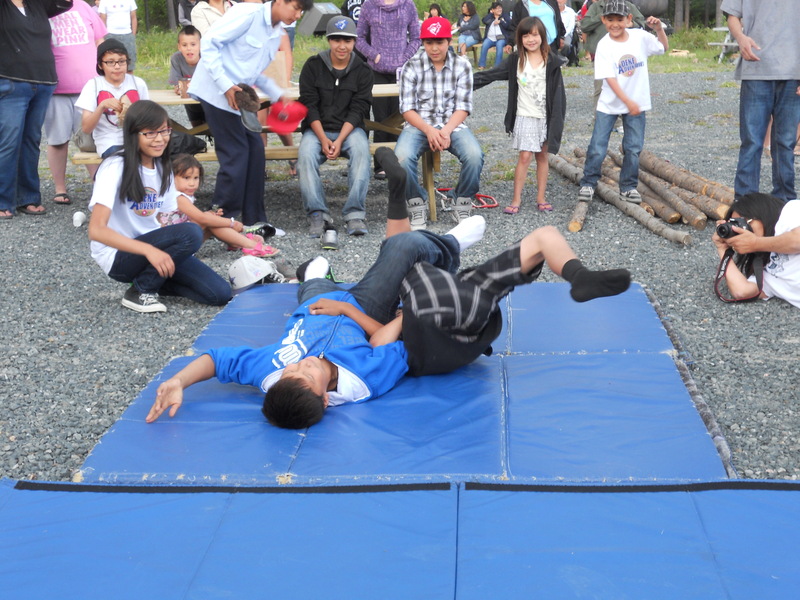 There were events at two locations: downtown at City Hall and oustide town at the Yellowknife River. At Somba K’e Park in front of City Hall, on the shore of Frame Lake, Yellowknifers came out in their numbers, to enjoy the sunshine, the food and the cultural events. Summer in Yellowknife is a wonderful time of year, and nobody would think that Winter was ever here, only a few months ago. I arrived in time to see the Edmonton Metis Dancers on stage, in their bright red shirts and the traditional sash. They performed a series of reels and jigs, to some very lively fiddling. I was somewhat surprised to discover that jigging is very popular up here, and not only among the Metis, but I suppose it’s a tribute to their heritage (part aboriginal, part european). It seems that no gathering is complete without a Red River jig, in particular. There were jigs in groups and in couples, and for one couples dance, it was interesting to note that it’s the men who dance backwards, always facing their partner. After years of having to dance backwards, and in high heels, I thought that was quite refreshing. At one point, spectators were invited to come up on stage and join in. As usual, the kids had the most fun and it was hard to get them off the stage. 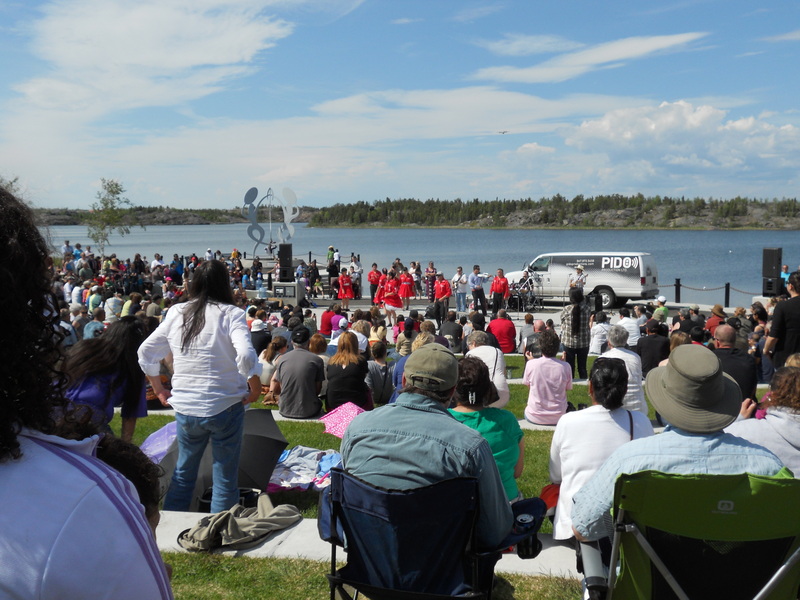 The celebrations at the Yellowknife River took on a different format. There was story-telling by an elder, displays of very intricate beadwork, music, demonstrations of preparing fish for cooking or smoking, some competitions: leg-wrestling and log-sawing; and last, but not least, drum dancing. No event is complete without food, and just as at City Hall, there was the traditional fish-fry. I don’t know why it’s called a fish-fry, because the fish is actually grilled. I’ve even heard people say that they’re frying the fish on the grill, which tickles my funny bone. It is grilled without any spices or flavourings, but because the fish is fresh, I found it edible, although very bland. I also tried bannock and caribou stew. Bannock is the traditional bread, very much like the biscuit of the southern U.S.. There was a baked plain version and a fried version with raisins, which I preferred. The caribou stew was interesting. Some people describe it as “gamey”, but I say it tastes like beef with a touch of liver mixed in. I also tried what’s called dry-meat, which is considered a delicacy, and is priced to suit. A friend kindly offered me a piece, which I had to pull off the main strip. 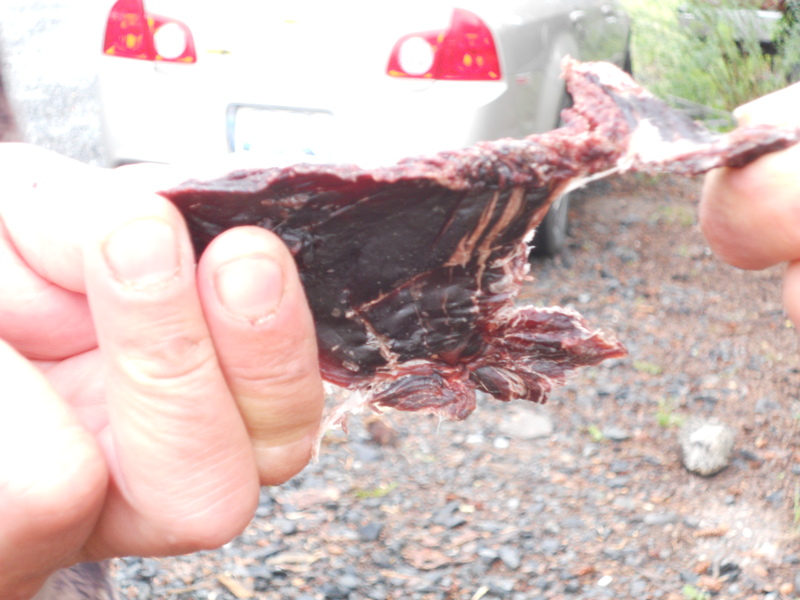 It’s literally dried caribou meat, sliced extremely thinly, with no spices or flavourings. I have never tasted anything like it. All I can say is that if I were to eat my old, unvarnished leather belt, it would probably taste like dry-meat. I didn’t take a big piece, but it took some chewing and a valiant effort at swallowing to get it down. There is another preparation of dry-meat, which I also tried. It’s pounded into a fine powder and mixed with honey and I think cinnamon, and it was a lot more palatable. With some food in me, I was ready to take in the contests. In leg-wrestling, the two opponents lie side-by-side on the mat, legs facing in opposite directions. The action starts when they hook their adjacent arms and legs and each tries to overturn the other. The girls were certainly not to be underestimated, and judging from the grins on the faces of all participants, it’s as much fun to do as it is to watch. Then there was log-sawing, in teams of 2, with others sitting on the log to hold it steady. Some teams were lightning fast and they rocked the log-sitters with the momentum. Around then, the rain started coming down and everybody scampered up to the stage to take shelter. As it poured, we were entertained with some flute playing by William Greenland, who always seems to be thoroughly amused whenever he plays. 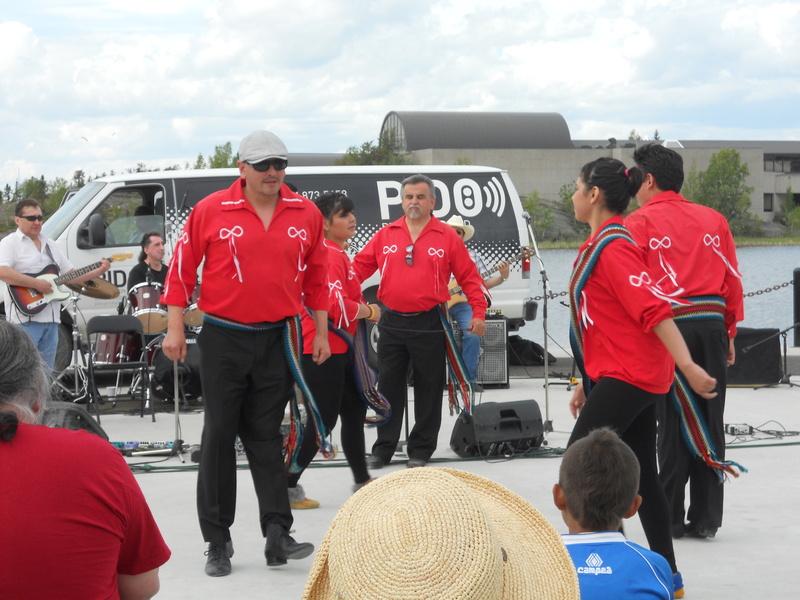 The rain didn’t look as if it was going to stop, so it was announced that festivities would be moved to the Chief Drygeese Centre in Dettah, territory of the Yellowknives Dene. We all jumped into ours cars and headed out for the short drive, but soon the weather cleared up, and everything moved back to the Yellowknife River site. Back at the river, it was time for hand games. In these games there are 2 teams, and the members of one team hide an object in their hands and the captain of the opposing team has to guess in which hand it is. The members of the team hiding it all hunch over to prevent the opposing team from seeing in which hand they’re placing the object. Hand signals are involved, there’s a referee positioned between the two teams and the team that is guessing is drumming throughout their turn, to add to the entertainment. There are often tournaments of this game, lasting for hours and played for money, but in this case it was played for sticks. When a team guesses wrongly, the hiding team members triumphantly hold up their empty hand, somewhat in a taunting fashion, and the losing team has to give up some sticks. 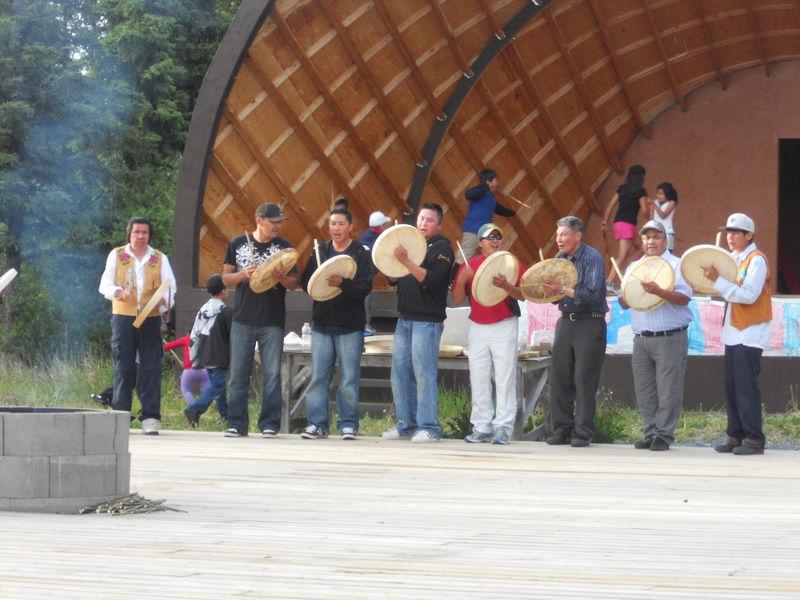 A few rounds of that were played, and then it was time for the finale, drum dancing. Drum dancing is exactly what it sounds like: dancing to drums. 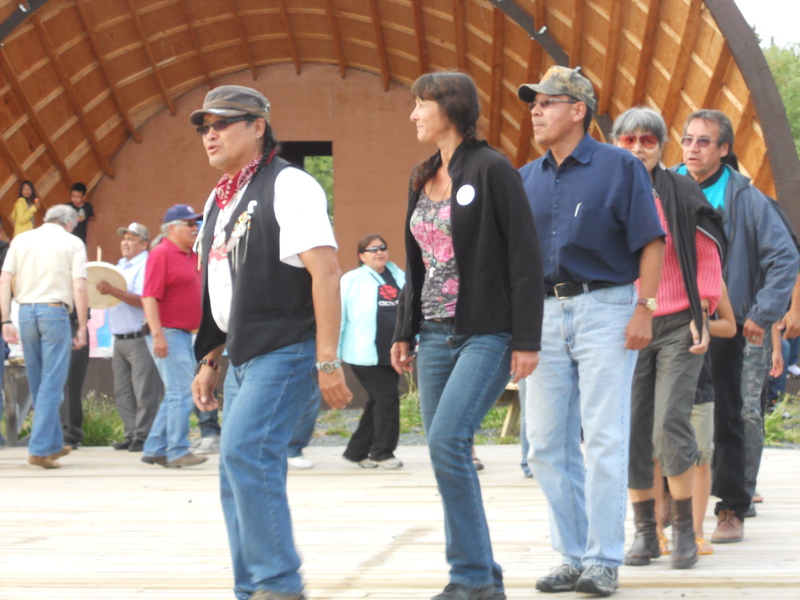 As with so many things in Aboriginal culture, dancing is done in a circle. There was a big wooden platform with a fire pit in the middle and the dancers moved clockwise. 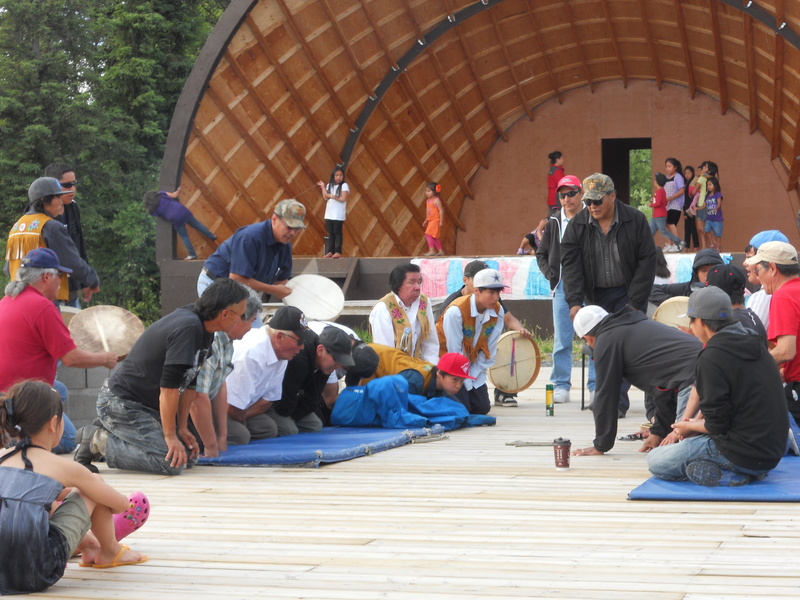 The Yellowknives Dene First Nation Drummers, some wearing their traditional beaded leather vests, started things off, and very soon one man got up from the crowd and started dancing, motioning for others to join in as he traced the circle. It didn’t take much encouragement, as young and old, Aboriginal and not, stiff and limber, all joined in. The dance was a tap-step, tap-step style and the drummers also sang. The pace was generally slow to medium and I could pick up differences in the speed of the drumming, but the words were lost on me. It sounded more like chanting then actual words, but what do I know? 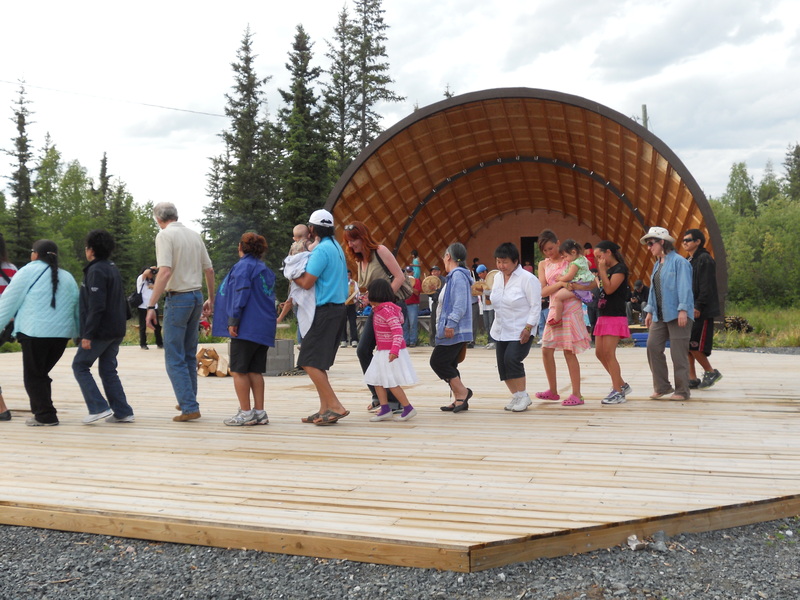 Most of the dances were done facing forward in single file, but there were some couples dances too, with the women on the inside of the circle, and a mountain dance, with origins farther north, where the dancers moved sideways, switching sides. The Dene believe that the vibration of the drums is the heartbeat of the Creator, that they are closest to the Creator when dancing to the drums. They also believe that drums represent unity, that dancing separately recognizes the spirit of the individual, but doing it as a group recognizes their relationships to each other and brings harmony. So there were whole families dancing, and even some very young children stayed in the circle right through. The drum frames are made from wood (birch) and moose or caribou hide is stretched across them and sewn with sinew. They are beaten with sticks, not with bare hands, and underneath, to hold them, is a string of sinew sewn in the shape of a cross. Evidently the hide loosens from the pounding, so the drums had to be held over the fire between songs, to tighten them. There were too many songs for me to count, and none of them was a short one. But the circle was full for each one and despite the earlier inclement weather, I think it was better to have the dancing out in the open, rather than in the enclosed hall in Dettah. The drums and the voices carried beautifully in the open air and I’m willing to bet that there were a few creatures in the bush who stopped to listen. A good time was had by all, and it was a fitting end to a wonderful day of celebration. I felt that I was there. Thank you Kathryn.